The prototype Nu-Track City Lift built on a VW Crafter CR50 base. 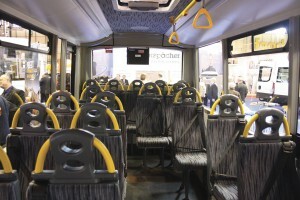 It will seat up to 22 passengers. The CV Show or to give it its correct title the Commercial Vehicle Show, organised by the SMMT, has of recent years become a very popular event at which minibus and coach builders and converters have promoted their products and once again that was the case last week with the staging of the three day 2015 Show in Birmingham’s NEC. It is also an important event for the base van manufacturers who use it to launch new models or significant innovations. All the main van manufacturers attend with the exception of VW. 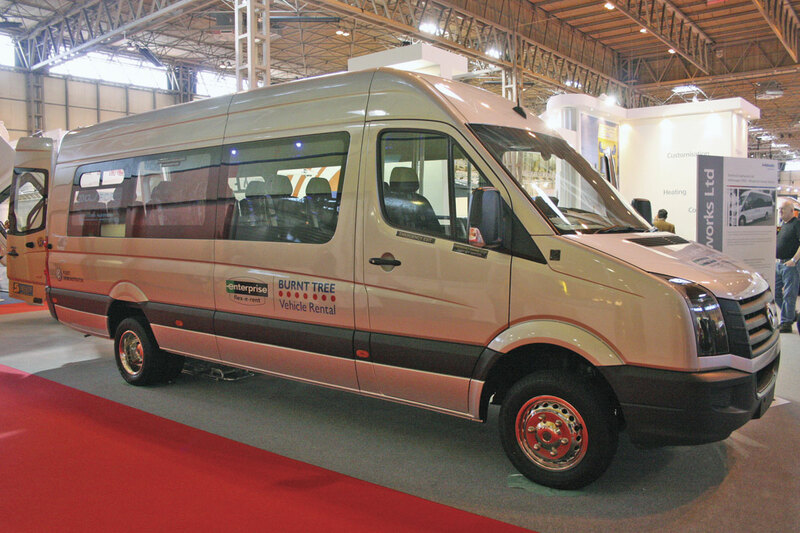 The key events involving the main van manufacturers centred on their mid-range vans. Perhaps the most significant among them was the introduction of the new Mercedes-Benz Vito. 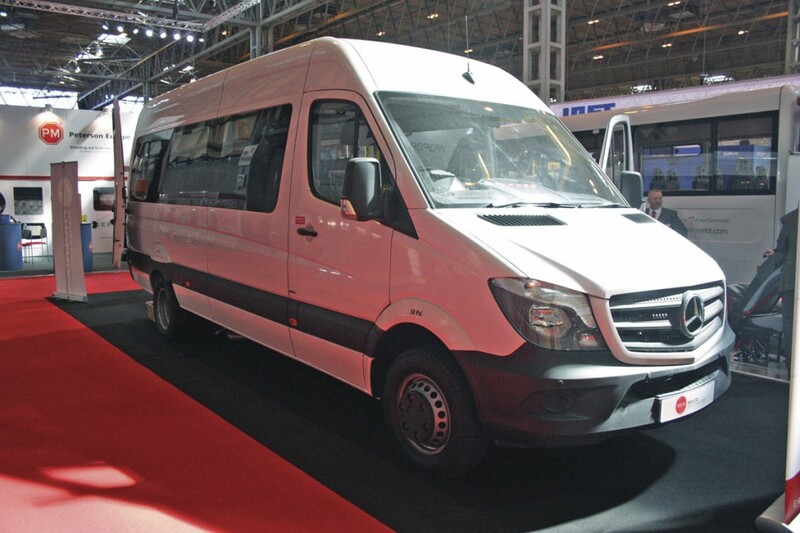 The Vito covers the 2.8 to 3.2 tonnes GVW sector and is available with three weight capacities, three lengths and with a choice of two engines with five power settings. There is also for the first time a choice between rear wheel drive or front wheel drive. All the new Vito’s are 140mm longer than the previous models. The front wheel drive versions use a compact 1.6-litre four-cylinder engine whilst the rear wheel drive versions use a 2.1-litre capacity four-cylinder diesel including the first engine in this class which meets Euro6 emission standards. The five power offerings are 88, 114, 136, 163 and 190bhp. Mercedes-Benz claim that not only are the engines more powerful, cleaner and quieter than their predecessors but they also have better fuel economy. 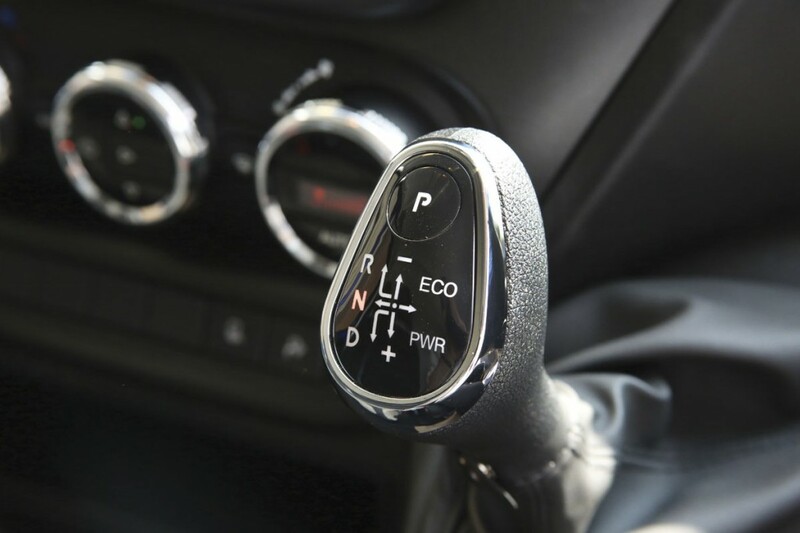 Standard transmission is the six-speed manual but additionally the 114,116 and 119 models can be specified with the 7G-Tronic Plus automatic transmission that has proved so successful in the Sprinter. Car like driving conditions have been a feature of recent Mercedes-Benz vans and the new Vito continues that trend as does the increasing list of standard features including Cruise Control with variable Speedtronic Speed Limiter, multifunction steering wheel with trip computer, and Audio 15 which provides a high-resolution TFT display and includes Bluetooth® hands-free system, audio streaming, USB and aux-in port, iPod® interface and SD memory card slot. Mercedes-Benz have been at the forefront of fitting advanced safety systems to their vans and the new Vito continues that trend. Alongside existing systems like adaptive ESP they have now added Active Parking Assist, proximity limiter, Intelligent Light System (optional) and Crosswind Assist. 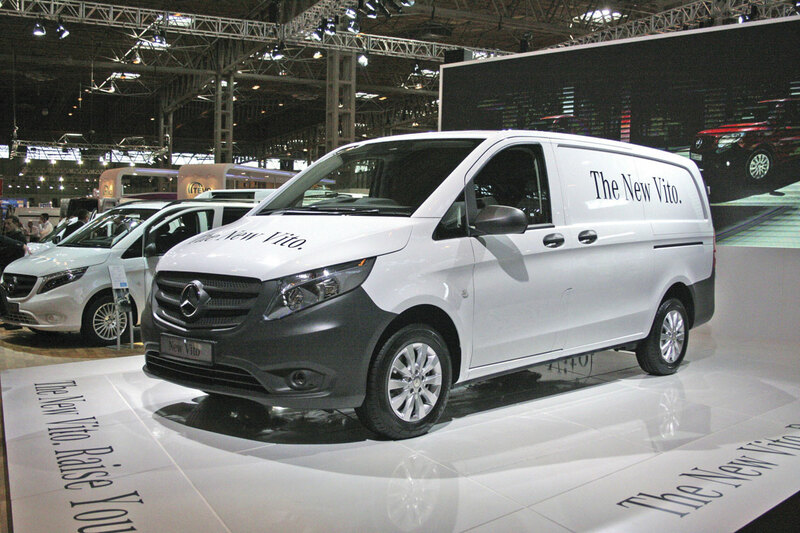 The Vito will be available in van, crew van and people mover formats. Mercedes-Benz did show a people mover variant at the Show highlighting the importance of the model in their range. Mercedes-Benz also announced additional safety features that will now be standard on all new Sprinters. These include Crosswind Assist which supports the driver in strong, gusty side winds through automatic brake interventions to help the vehicle stay in lane. Additionally, Collision Prevention Assist, Blind Spot Assist, Highbeam Assist and Lane Keeping Assist are all new features available optionally. A small item but nevertheless an important improvement is a new design gear lever located on the centre console which has better ergonomics and creates more space. Mercedes-Benz did not feature a minibus on the stand but they did have a Sprinter Transfer displayed at their extensive external display. 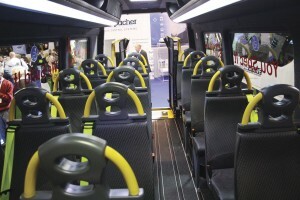 It was a 15-seat version with plug style entrance door and an extra AVS entrance step. Both Renault and Vauxhall focused heavily on their new mid-range models, the Trafic and Vivaro models respectively. These of course were presaged at last year’s Show but they are now in volume production. 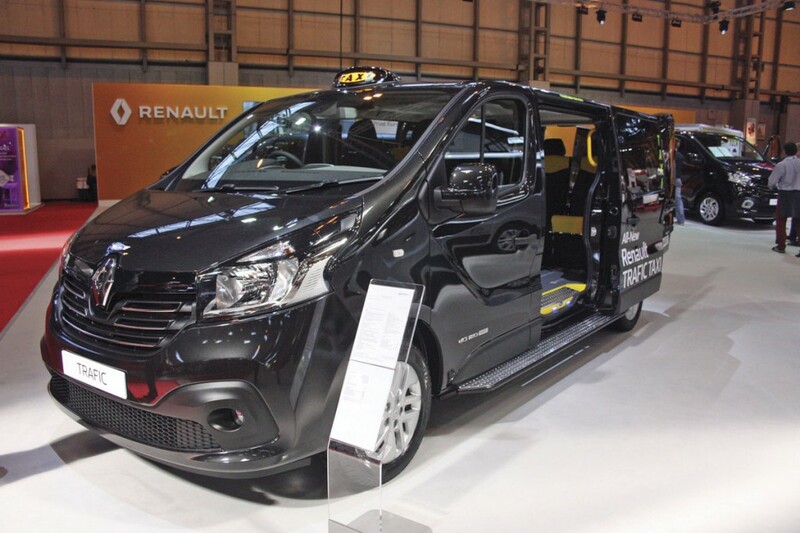 Of interest to coach and bus operators was a factory supplied taxi wheelchair accessible version of the Renault Trafic. Iveco had one of the most interesting developments which was the introduction of a new eight-speed automated transmission for the new Daily. Called Hi-Matic, it replaces the previous six-speed AGile system. Iveco say that the new transmission addresses the various deficiencies of the previous transmission system. Produced by ZF, rather than Iveco, the new transmission is going to be available in three formats, Urban, Regional and International, giving programming suited to different operating needs. Urban is designed for town and city centre operation. It has a self-adapting shifting strategy which adjusts the control logic to the precise need using a choice of 20 in-built programmes. Regional offers outstanding performance and offers two driving modes: Eco which gives smooth low speed gear changes thus enhancing fuel economy or Power which carries out changes at higher speeds for enhanced performance. International features a double overdrive gear ratio and a turbine torsional damper torque converter giving improved fuel economy when driving long distances at higher speeds. As with the previous transmission, the option to drive the transmission manually is retained. I haven’t had an opportunity to try out the new transmission for myself yet, something I will be rectifying in the near future. I did ask on the Fiat stand whether the transmission would also be being introduced on the Ducato but could not get this confirmed although I have to say I think it is highly likely. Citroen announced at the Show that its largest van model the Relay would be available with Euro6 engines later this year. Although VW were not at the Show, strong rumours were circulating that new T5 and Crafter models are under development and could well be introduced before the end of the year. For many years the focus of these exhibits has been the stands of heating and ventilation specialists Eberspächer and Webasto and that tradition continued. 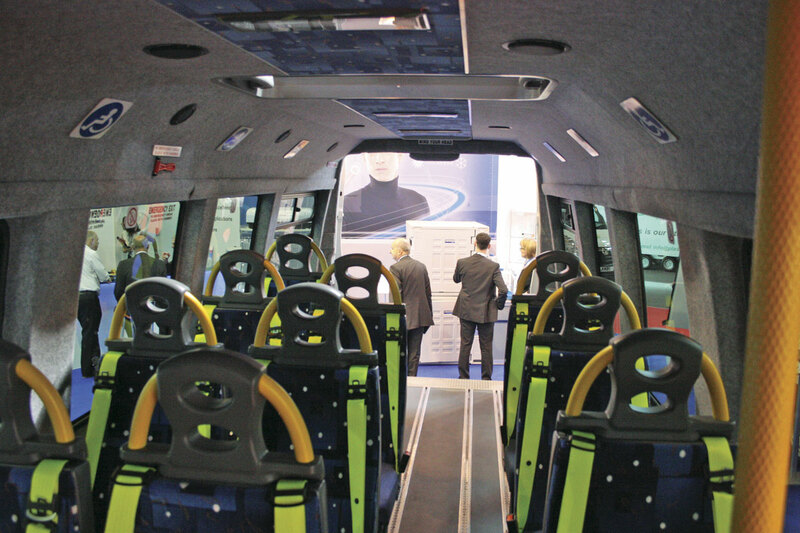 One exception to that rule is Treka Bus which had its own stand as well as showing product on the Eberspächer stand. 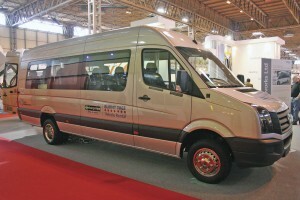 On its own stand it showed a coachbuilt Treka 16 mounted on the Mercedes-Benz Sprinter 516 and alongside it an example of its conversion of the Sprinter 516 panel van. The coachbuilt vehicle was the first to be built with a new system of internal trimming. 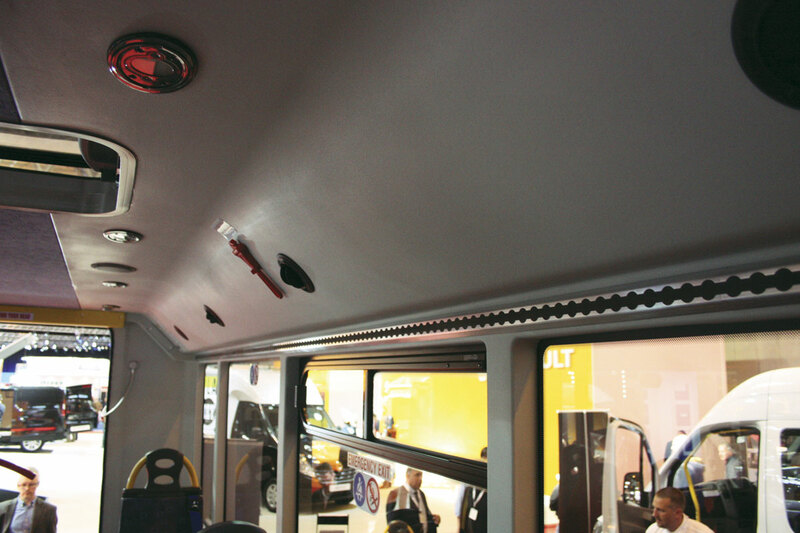 Having recently set up its own glass fibre manufacturing facility, Treka Bus has decided to produce its internal trimming panels as complete units, for example, the whole upper side panel including window surrounds and ceiling coving. This has benefits in reducing the number of seams that have to be sealed. It also has major advantages in speeding up production. 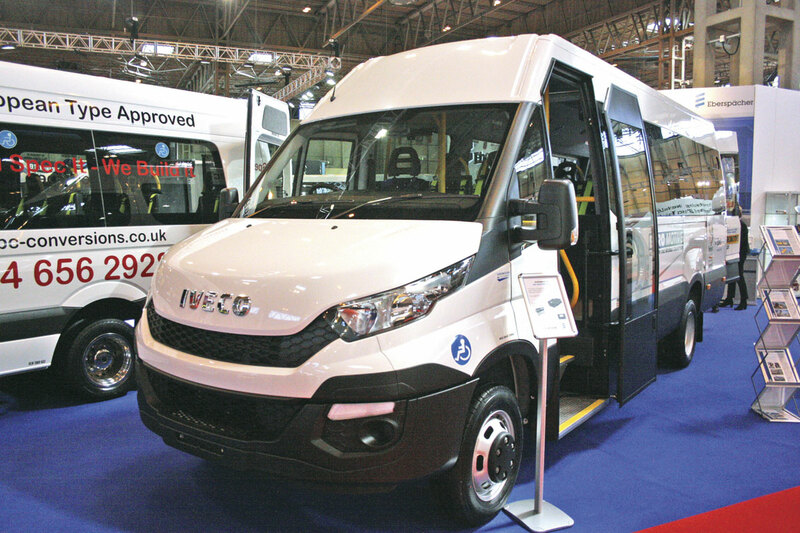 The vehicle on their stand was built to the London Hire specification with 16 Rescroft CT-Space seats on tracking, a plug door with fold out extra step and a PLS underfloor cassette wheelchair lift with modified hand rail releases. This is something Treka Bus has developed jointly with PLS and makes the rails easier to deploy and fold down. 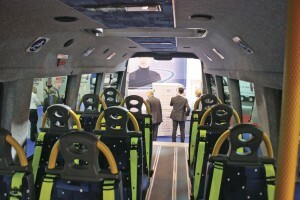 The vehicle also featured London Hire’s cyclist warning system and Treka Bus’s unique adaptation of the PLS Door safe system, which allows it to be simply disconnected and moved to another vehicle. 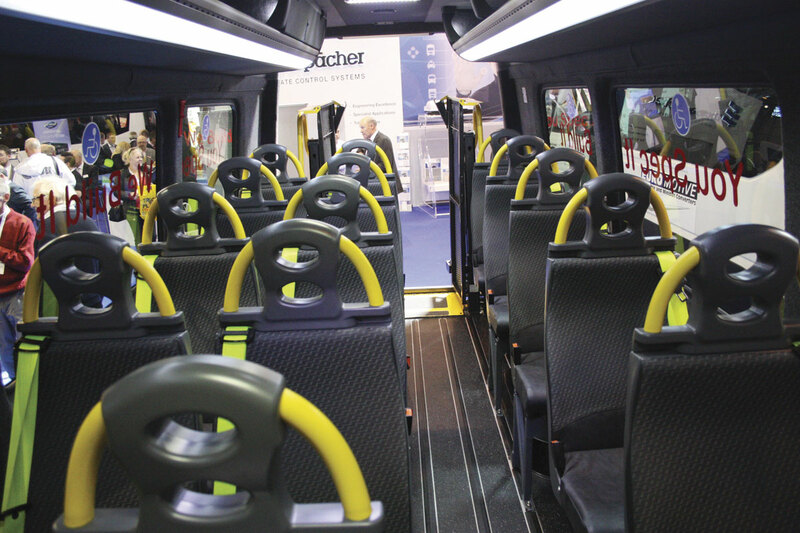 Other standard Treka Bus features include bonded, tinted double glazing; air conditioning and convection heating. The van conversion, which was one of a batch being built for the London Borough of Havering, essentially carries over the standard Treka coachbuilt features. This vehicle was equipped with Phoenix seating including examples of the Shuffle which can be tipped up and slid along the floor tracks to allow wheelchair space to be created without physically removing seats. Treka Bus is always looking for ways to improve its products and MD, Mark Clissett, told me that the latest addition was fitting a spray suppression barrier behind the rear axle to protect the wheelchair lift. On the Eberspächer stand they showed one of the coachbuilt Treka 16s they are building for regular customer Dawsonrentals. 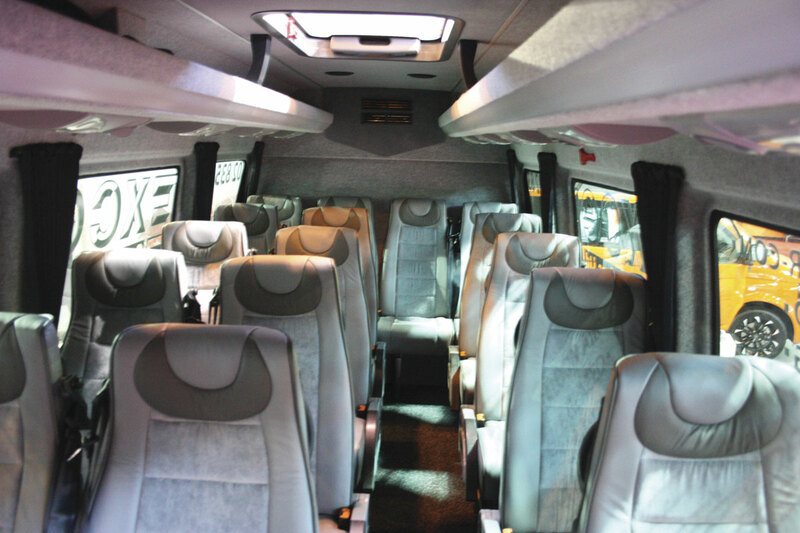 The vehicle, a Mercedes-Benz Sprinter 513 had seating for 16 using Phoenix seats, a plug door with extra fold out entrance step and a PLS rear mounted tail lift. Euromotive, the Kentish vehicle converters, showed a very neat conversion of the new Iveco Daily 50-170 with plug style entrance door. The vehicle can carry ten seated passengers and two wheelchairs or alternatively six wheelchairs. These are loaded at the rear using a Ratcliff-Palfinger tail lift. 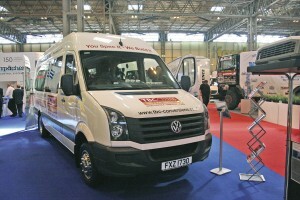 Taxi & Bus Conversions (TBC) from Northern Ireland showed a conversion of the VW Crafter CR 0. It featured bonded double glazing, air conditioning and a plug style entrance door with extra step. The vehicle can carry up to 16 passengers or a combination of seated and wheelchair passengers. Wheelchairs are loaded through the rear using a Braun in-board tail lift. 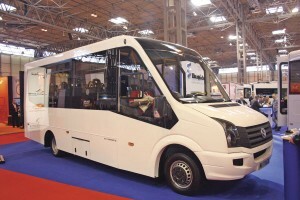 Mellor used the show to promote its Orion directly wheelchair accessible coachbuilt minibus. Geoff Hudson, MD of Mellor, told me that he was very pleased with the way production of the Orion has been integrated into Mellor’s. The combination of producing the body shells off site at Scarborough and then transferring them to Rochdale for fitting out and commissioning was working well. They were achieving good production rates and high quality. That latter claim seemed well borne out by the example on show. This was built to service bus standard without rear loading doors. A wheelchair passenger accesses the vehicle through the wide front entrance and the wheelchair bay is in the conventional position behind the driver with the passenger facing rearward. The vehicle had seating for 20 and can also carry two standees. If a wheelchair passenger is carried seating falls to 18 and no standees. Excel Conversions from Doncaster showed the only minicoach. It was a Mercedes-Benz Sprinter 516 manual and was built to the usual high standard one expects from Excel. It featured bonded, tinted, double glazing; air conditioning; convection heating and a forward entrance. 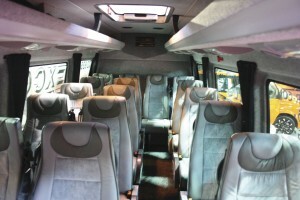 Within the coach there is a flat floor and seating for 16 passengers in luxury leather effect trimmed recliners. The vehicle was also fitted with a body styling kit and a large drop well boot with one piece boot door. Stanford, which celebrates 25 years in business this year, showed vehicles on both the Eberspächer and Webasto stands. On the Eberspächer stand there was a Mercedes-Benz Sprinter 513 from the latest batch they are producing for London Hire, a regular customer. The vehicle had seating for 15 using Rescroft CT-Space seating, a plug entrance door with Stanford’s own fold out combined entrance steps and hand rails which now feature hand rails on both sides, double glazing, air conditioning and convection heating. Wheelchairs are loaded through the rear using a PLS underfloor cassette type tail lift. The vehicle on the Webasto stand was a VW Crafter CR50 manual for another of their regular customers, Burnt Tree Access-a-Bus, which these days are part of the Enterprise Group. It featured a plug door, 15 Phoenix seats and a PLS rear mounted tail lift. The vehicle can carry up to five wheelchairs and retain conventional seating for three. Stanford also showed one of their mini motor homes based on the VW T5 Transporter. GM Coachwork from Newton Abbot showed one of their popular conversions of the Peugeot Boxer. The vehicle featured a plug entrance door with GM’s own fold out handrail-equipped entrance steps. 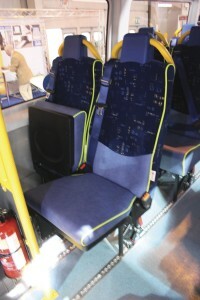 The vehicle had seating for 13 or alternatively can carry two wheelchairs and five seated passengers. Wheelchair loading is through the rear using a Braun lift. Nu-Track from Northern Ireland announced two new models at the Show although it only showed one of them. This was the City Lift which they have developed in conjunction with dealer, Lookers of Glasgow. The vehicle was very much a prototype. It was built on a VW Crafter CR50 and had seating for 22 passengers. Nu-Track is working with SV Tech to have the rear axle uprated to 5.5 tonnes which is well within its designed capacity. It has a three step entrance with plug door, flat floor and rear loading of wheelchairs using a tail lift or ramp. Although the prototype example is built on the VW Crafter Nu-Track do intend to offer the same vehicle built on 5.0-tonne Mercedes-Benz Sprinter and the new Iveco Daily. Perhaps of more interest was the announcement of the City Dash. This is a directly wheelchair accessible 16 seater. It will use a new design of Al-Ko ultra-low line, air suspended chassis matched to a Fiat Ducato Maxi front end. It will have a wide front entrance with plug door and can be specified in service bus form with a ramp for wheelchair access or as a conventional accessible minibus with a single step at the entrance and rear doors with fold out ramp for wheelchair loading. In the latter form up to six wheelchairs can be carried. The body will be of aluminium alloy construction and will provide a minimum gangway width of 440mm. 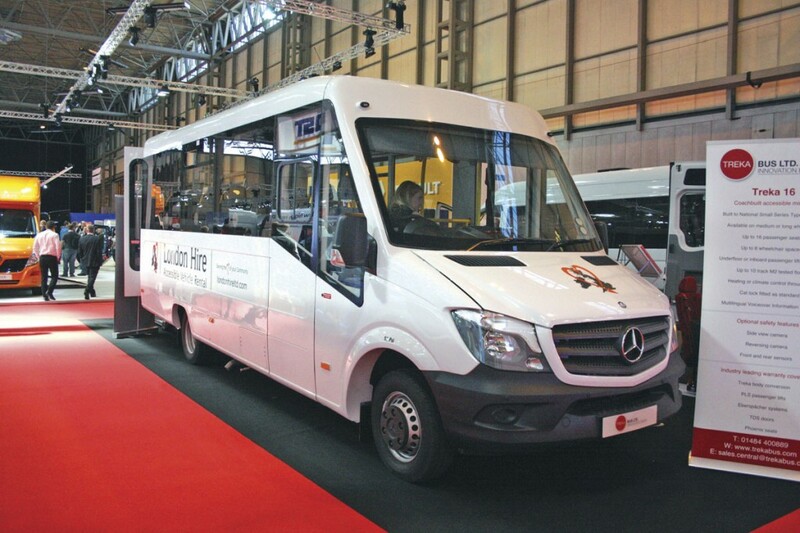 Nu-Track are certainly making waves in the accessible minibus world with the introduction last years of the Pulse large accessible vehicle and the Nu-Vibe rear engine, low floor, directly accessible design and now the new City Lift and the City Dash. As ever the CV Show proved to be really interesting from a minibus point of view with new models, new innovations and an overall feeling that the situation in the market is improving.